Hello! Today I am going to be making a post for our Global Issues Novel Study (GINS) which began back in October. I am posting today about the Canadian Charter of Rights and Freedoms in connection to the events in my novel, War Brothers by Sharon E. McKay, and the country it takes place in. My novel takes place in Uganda, so that's how I will be phrasing the questions. Credits to this website for this image. Is there a similar document to the Charter of Rights and Freedoms in Uganda? The Ugandan government has a constitution which lays out the basis of their government. I found it very interesting that there was a large focus on not speaking against the constitution, because that would be considered treason. What rights and freedoms are guaranteed in the document? "Dozens of people in the north-eastern Karamoja region were reported to have been killed during the year in disputed circumstances by government soldiers engaged in security and disarmament operations. Army personnel were also accused of committing torture and other ill-treatment in the course of these operations. The government did not institute credible investigations into alleged human rights violations and no one was brought to justice. In October, the Uganda Human Rights Commission reported that torture and ill-treatment by the police, other law-enforcement officials and the military remained widespread." How might the issue in your novel be different if the Canadian Charter were applied? The major issue at hand in my novel is Joseph Kony's LRA (Lord's Resistance Army). It is established throughout the novel that Kony is the "bad guy" (for lack of a better term), and the government are the "good guys" who are trying to catch Kony. This is right in a sense, but there are many crimes that go against their charter which the police force or government of Uganda has committed. 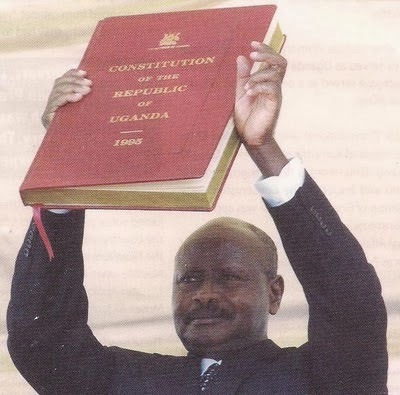 The thing is, Uganda has a constitution which outlines almost all the rights we have in Canada, and more, and when I read it I found it to be very fair and respectful to the citizens. However, if the government doesn't follow it than what use is it? Therefore, I feel that if the Canadian Charter were applied, it would be the same situation as what is going on now. The problem is, even though rights and freedoms are in place in the Ugandan Constitution, the government does not respect or follow them, so why would the Canadian Charter be any different? Both the Canadian and Ugandan charter's prohibit the kind of behaviour the LRA is showing, so I don't think the difference would affect it. The one thing I noticed is that because the Ugandan constitution does not have mobility rights, people who are afraid and in danger would not be able to leave the country. As it says in the Mobility Rights of the Canadian charter, 6. (1) Every citizen of Canada has the right to enter, remain in, and leave Canada. I couldn't find anything that expressed that Ugandan citizen could do the same. Therefore, more children and women could be held kidnapped by the LRA, more causalities would occur, and more people would be traumatized because they may not be able to leave the country when the LRA was at large. I really liked how you had another link to help your readers fully understand the project that we did. I loved that fact that you but quotes and brought the book it to your posts. your text in all of your posts are very mature. Your roundtables tell me that you and your group had lots to talk about and seemed really interested in what every ones thoughts were. really good job keep it up!!! Danika, I thought you did a lovely job on all your posts. They say a picture describes a thousand words but in your posts, I found myself saying your words made so many pictures! I could really visualize what was happening in your book which was great! In your latest post (#5) you had many connects with the Charter of Rights and Freedoms. Do you think that some other constitution such as The Bill of Rights would be better? If so, why? I think that you did a great job on all of your posts. They all had plenty of descriptions and i could see you really put effort into everything you wrote. Why do you think it is that the government is not following the charter even though it stresses that no-one may disobey the charter since that would be considered treason? Do you think that if there was a change in the charter where the citizens could vote more often for a new government chage this predicament? Burn for Burn Post One!